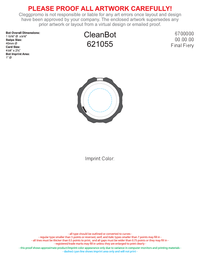 • Imprint area on CleanBot: 1" dia. • Approximate continuous run time is 10 minutes. Intermittent power use is longer. string(21) "1 15/16" dia. x 9/16""
1 15/16" dia. x 9/16"